Prepare coffeehouse style specialties in the comfort of your own home with the E8 coffee machine from JURA. Taking inspiration from the world's best baristas, this coffee and espresso system utilizes revolutionary Pulse Extraction Process (PEP) technology which optimizes the extraction time, allowing even short specialty coffees like ristretto and espresso to be prepared with an intensity and breadth of aromas like never before. 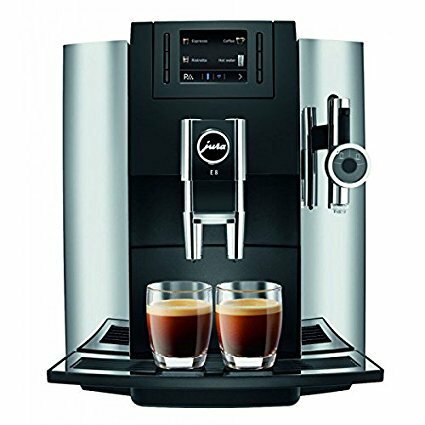 With eight different intensity levels and 12 programmable specialty beverages, ranging from flat whites and macchiatos to cappuccinos and more, coffee lovers can customize their coffee just the way they like it. The six-level AromaG3 grinder ensures that the coffee is optimally ground, every time, and the innovative fine foam technology delivers fine milk foam that's as light as air to complete your favorite espresso beverage. Packing incredible performance into its compact size, the E8 fits into your home -- and your busy schedule -- seamlessly.